Make portion control a breeze with our collection of portion spoons! This 6 oz., solid, black portion spoon is one-piece and can be used to measure food for both wet and dry portion control. It has a color-coded handle for easy identification and kitchen organization! The colored handle eliminates the stress over spending too much time searching for the right spoon. I use it for measuring my Fruit for smoothies. It’s easy to hold and it made from good quality steel. It also help me alot for my business. The notch on the grip handle is great as it keeps the spoodle from falling into the sauce bucket. Only 4 Stars because the spread that this gives tends to be streaky. But for the price, can't complain too much. Color coding the handles is especially convenient if you've got multiple spoodles in your sauce bucket at once. 6 oz one piece solid portion spoon. I thought it would be hard to scoop with this due to the shape of the spoon but it has worked out for us. Inexpensive and fast delivery. Great sturdy design to use in our restaurant chain. It allows us to control the food cost by controlling the amount of proteins we serve in each of our dishes. It has a handle that doesn't get warm despite being near vapor. 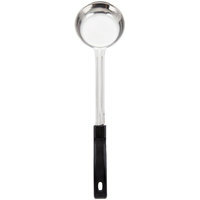 This 6 ounce one piece solid stainless steel portion ladle is fantastic. It has a flat bottom that works great for making pizzas (scooping and spreading the sauce.) Precise measurement every time. High quality at an affordable price. This portion spoon is a must have in every restaurant. It’s color coded so that your line cooks always know what size they are using. This style portion spoon is a must have in a pizzeria. They are the perfect sauce portion for a large pizza. The flat bottom makes it easy to spread evenly. Good quality for the price. We would recommend it It is a standard portion spoon that works great in in warmer application. it does have a plastic handle which is a good and bad thing. This 6 ounce portion spoon has a solid bottom which makes it perfect for serving soup, gravy, or any other food service item where you want the liquid to be served with it. Since each different color of spoon in this line is a different size, it allows you to switch between portion sizes very efficiently. This size is nice for making my own spice mixes. Easy to measure easier than a measuring cup listed with measures on side. More accurate measures. Awesome portion control to help the bottom line on serving size. No kitchen should be with out these scoops. Durable and time saving made into each spoon. The 6 oz. One-Piece Solid Portion Spoon is one of my favorites. The quality is excellent, like something that you would find in restaurant or cafeteria. Great for serving and measuring out portions. This is definitely a good value. Great little tools to help manage your food coat. The handles are also extra long and work great for prep and for portion contro. Nice price as well. Great for a commercial environment, but these also work well for people wanting to precisely measure out food because they're watching their wait. Very convenient and good price. These are good spoon. No need to weigh anything when these dish out just the right amount. They are color coded so eay to grab the right one needed. I ordered them in all available sizes. We bought these for our pizza fundraiser. The 6 oz portion was perfect for putting marinara sauce on on 16 inch pizza crusts. The flat bottom helped students accurately spread the sauce to the edge. LOVE it. As in all restaurants measurements are important to the bottom line. This 6 oz solid portion spoon is the right size for our pizza sauce. The flat bottom is perfect for spreading it out. Will buy again. the perfect portion spoon for my pizza work station. It sauces the pizza crust to perfection and with the correct measurement of sauce. I will get more to be on the safe side. This one piece portion spoon is very sturdy. This spoon helps to drain all the juice off the food makes the job much better. I am going to buy more. I use this spoon very often. I find it is just as easy to cook in bulk and freeze than to make enough for one meal. What one needs is the right tool. This 6oz one piece solid portion spoon is perfect. The handle doesn't burn when I am scooping out the right amount portion....just great for my diet where I need to input online exactly the portion I am eating. If you care about the size of your portions, buy the set of these spoons...each size is a different color so I will always know the portion amount. I'm a volunteer cook at Project Food, a 30 year old charitable org associated with First Congregational Church of Riverside that provides free hot meals once a week (Wed 5:30 - 6:30 PM) to 180+ guests. We recently revamped and upgraded our to kitchen to a commercial level, thus needed to upgrade our serving utensils to the same level. I checked out numerous places and found Webstaurant Store to be our best source and price to serve our needs. Bought 4 sets each of the 4 and 6 oz spoons, perforated and non-perforated and our line servers couldn't be more happy! Lightweight, yet sturdy making serving less of a task while providing excellent portion control. Stainless steel, plastic handles (meets health codes) and washable in a commercial dishwasher. Handles are also color coded - black for 6 oz and green for 4 oz. Great purchase, highly recommended! This portion spoon is not only great for portion control but for basting things like steak or fish while cooking them stove top. This is super sturdy. These are a must have if you are serving a large group of people. They allow you to control the amount people get and feel very well made. Its nice that they come in different colors. This 6 oz spoon is just what we needed to help with portion control. We use it for vegetables mainly because that is what we should have more of rather than starches. Either way this spoon is a great selection for serving. The 6 oz. One-Piece Solid Portion Spoon is just the right size. The spoon helps you make sure that you don't get too much food, but enough so that you can be okay. Great spoon. arrived fast. These are handy spoons. We have been using them to portion our our pizza sauces. They are holding up very nicely. I like that they are different colors for different sizes. This is a great ladle compared to the two piece type for some reason these feel more comfortable when using, prices are great as always at WR. I absolutely love this color coded ladle! As a culinary student, I use this tool to quickly measure stock and other things needed in recipes. This 6 ounce solid spoon really made it convenient to serve and control carbohydrate portions. The handle was curved very comfortably and was easy to hold and serve. For some reason I like this soup spoon better than a ladle for portioning our chowder. It has a nice lip that keeps it in place on the edge of the soup pot. Good quality, but not recommended for pizza. The bottom is very flat and only pushes sauce around. If you're looking for a pizza spoodle I'd suggest something with a slightly curved bottom. These make portion control a breeze for the sides/starches - rice potatoes etc. My server like them, as it takes the guesswork out of the process. We don't use this to sauce our pizzas ('cause we only go up to 14") but we do use it to portion croutons on our Caesar salad, and it works wonderfully. Much quicker than scale, and easy to identify as our "salad ladle" because of the black handle. I love these color coded portion spoons which are great not only for serving the same amount of food to everyone but also to measure out dry ingredients from tall bins without having to dig deep into the container with a tiny measuring cup. These are helpful when enthusiastic children offer to serve food at parties. The function far exceeds the price. We have given this spoon just one job and let me tell you, its an over achieving pizza sauce ladle, I mean spoon! Great buy - sturdy construction! This six ounce spoodle gives every customer the right amount on their plate. And more importantly it helps you give each customer the same amount. This 6 Oz Stainless Steel with plastic handle is just perfect for serving mash potato, potato salad. Very sturdy I would recommend friends and buy more.